A £115 million emergency care centre (ECC) is being built in Aberdeen that will combine accident and emergency, an acute medical assessment unit, an out-of-hours GMED (Grampian Medical Emergency Department) service and ward accomodation at Aberdeen Royal Infirmary, in the largest project ever undertaken by the NHS in the north east of Scotland. The project is being constructed using an energy-efficient design and, in line with this, CCL supplied its CARES-approved XF20 post-tensioning system (designed and manufactured to ETAG 013) and supervised the installation. Post-tensioning reduced slab depth by up to 50 mm per slab, thereby reducing the amount of concrete and steel reinforcement needed, making the construction process more environmentally friendly. The aim of the ECC is to improve the experience and patient care for those needing urgent or emergency treatment. Cabinet secretary for Health and Wellbeing, Nicola Sturgeon, said on the Scottish Government website: ‘for the first time all emergency and out-of-hours services will be brought together at a single site, providing seamless state-of-the-art treatment for patients’. 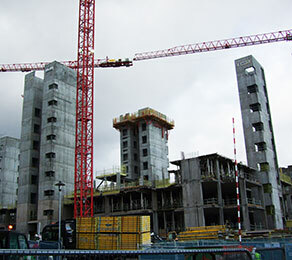 Work began on the centre at the start of 2009 and CCL’s total project schedule ran for six months, from September 2010 to March 2011. The ECC opened to patients at the end of 2012.